Sinai Urban Health Institute (SUHI) unveiled its plan to conduct the largest door-to-door health survey, Sinai Community Health Survey, ever done in Chicago at a press conference Tuesday morning at the Humboldt Park Diabetes Empowerment Center. With support from The Chicago Community Trust, which provided the community survey with a $1 million grant, SUHI will pull together data about the health of local individuals and communities, which ultimately may change health programs and resources. The results of SUHI’s 2002 survey created 31 different health interventions and programs and approximately $17 million in funding. The current SUHI survey will encompass 700 questions on adult and child health from 3,000 adults and 1,500 children. These questions will be selected and approved by a Community Advisory Council (CAC). “Our previous research has demonstrated that literally thousands of people in the city die each year due to disparities in health. This is a situation that must be and can be remedied. It is literally a matter of life and death,” said Steve Whitman, PhD, the Director of SUHI and the Principal Investigator for this project. The Chicago Community Trust has connected donors with community needs by making grants to organizations working to improve Chicago. In 2012, the Trust, along with donors, granted more than $130 million to nonprofit organizations. 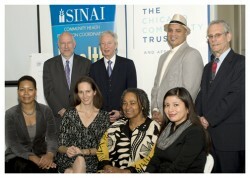 Sinai Health System, a Chicago-based private, not-for-profit organization, is comprised of seven member organizations: Mount Sinai Hospital, Holy Cross Hospital, Sinai Children’s Hospital, Schwab Rehabilitation, Sinai Medical Group, Sinai Community Institute, and Sinai Urban Health Institute.